The purpose of this site is to present matters of Scott County Kids. We encourage you to submit your questions, comments and concerns, but please note this is a moderated online discussion site and not a public forum. Please note that the comments expressed on this site do not reflect the opinions and positions of Scott County Kids or it’s officers and employees. If you have any questions concerning the operation of this online moderated discussion site, please contact jesse.mumm@scottcountyiowa.com. All data and information provided on this site is for informational purposes only. Scott County Kids makes no representation as to accuracy, completeness, current-ness, suitability, or validity of any information on this site and will not be liable for any errors, omissions, or delays in this information or any losses, injuries or damages arising from its display or use. 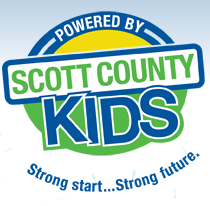 Due to the possibility of unauthorized modification of electronic data, errors in transmission, HTML browser incompatibilities and other aspects of electronic communication that are beyond our control, information contained in the Scott County Kids website should not be considered suitable for legal purposes. Information may have been updated since the last modification of the site. Contact the Scott County Kids office directly to verify accuracy. Website postings will be information regarding programs that are supported or funded by Scott County Kids, no outside information will be posted. Scott County Kids WILL NOT SOLICIT INFORMATION TO BE INCLUDED ON SOCIAL MEDIA. We strive to foster engaging, productive conversations. To that end, we encourage you to submit questions and comments. We also encourage you to submit photos and videos to showcase what is happening between the public and Scott County Kids. However, please note that visitors are responsible for what they post on this site. Any views or opinions expressed in visitor-posted content reflects the views of the comment’s author and are not the official views of Scott County Kids. We will try to respond to question on this site as frequently as possible. However, we cannot promise we will respond to any or all questions posted on this site. To ensure your question, comment, or concern is addressed please contact us at 563/326-8221. We monitor all comments and content visitors post on social-media sites to ensure all content is content is constructive and suitable for all viewers, while respecting the range of opinions and points of view. Social media is a 24/7 medium. However, we cannot monitor comments 24/7. Moderation will take place during Scott County Kids’ normal business hours. We reserve the right to remove any comments or content. We also reserve the right to suspend comment privileges of anyone who violates these rules. When Scott County Kids follows or “friends” persons or organizations, it is not an endorsement by Scott County Kids, but instead is intended to facilitate communication between Scott County Kids and the person or organization. Additionally, some links on this site may lead to external resources. These links should not be intended to facilitate communication between Scott County Kids and the person or organization. Additionally, some links on this site may lead to external resources. These links should not be interpreted as an endorsement by Scott County Kids of these sites or their content, viewpoint, accuracy, opinions, policies, products, services, or accessibility. Scott County Kids believes the local community services are instrumental in serving the needs of our families. Determination of suitability and approval are at the discretion of Scott County Kids. Materials are posted for informational purposes only. This does not imply Scott County Kids endorsement of them. All information must be appropriate for the Scott County Kids audience. Information should relate to children and families or child care providers or other professionals working with families. Information must contain a contact name and phone number or persons who desire further information. If a registration form is included, clearly state where and to whom the form should be returned. Scott County Kids will not participate in collecting forms or fees. Materials will be reviewed for appropriateness and potential posting as staff are available. Scott County Kids does not promise posting of information within any particular timeframe. Scott County Kids does not guarantee posting of material or information.